Accompany dragons and wizards through fantastical landscapes in . 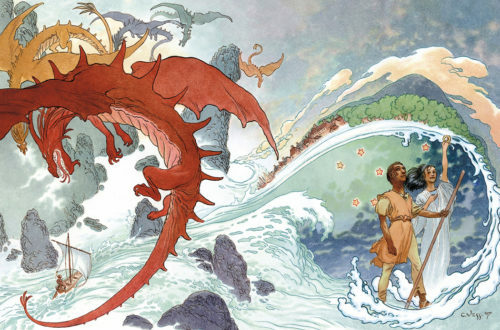 This exhibition at the William King Museum of Art is an opportunity to view world-renowned artist and local favorite Charles Vess’ fifty-six original illustrations for legendary novelist Ursula K. Le Guin's Earthsea saga. Join WKMA and Charles Vess for a public reception on February 7, 2019 from 6 - 8 p.m. Sponsored by Johnston Memorial Hospital. Public Reception: February 7, 2019 from 6 - 8 p.m. This event is free and open to the public. For more information call (276) 628-5005 ext. 107 to speak with Sarah Stanley, Curator at WKMA.